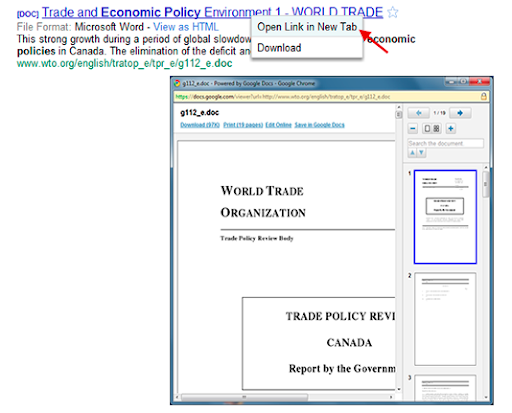 the Chrome extension, Google Docs PDF/Powerpoint Viewer, that allows you to preview PDFs and Powerpoint presentations in your Google Chrome browser without having to download them. With more than 400,000 users, the Google Docs PDF/Powerpoint Viewer extension has become one of the most popular extensions in the Chrome Extensions gallery. Since the launch, we have continued adding features such as support for previewing Microsoft Word documents and made the extension available in all 48 languages that Google Docs supports. As we continue to add more features to our extension, we are also excited to see developers create extensions that add more functionality for Google Docs. For example, you can use Snippy to grab and save snippets of web pages and upload them to Google Docs. Another great extension is Table Capture that lets you easily copy and paste HTML tables into Google spreadsheets. There are also extensions that help you get to Google Docs faster. The New Spreadsheet and New Doc extensions add a button next to the address bar for quick spreadsheet and document creation. You can find more extensions in the gallery. There are more than 5,000 extensions waiting to be discovered by you. Six months ago, we launched the Chrome extension, Google Docs PDF/Powerpoint Viewer, that allows you to preview PDFs and Powerpoint presentations in your Google Chrome browser without having to download them.